Hypersensitivity to sound (hyperacusis) is described as a reduced tolerance to sounds of average intensity, sometimes accompanied by painful sensitivity to ordinary environmental sounds, with perceptual, psychological and social dimensions . The causes of hyperacusis are still debated ; recent brain-imaging studies indicate hyper-excitability of specific areas of the brain as a common finding in these patients [3,4]. Available evidence suggests that hyperacusis may follow functional changes within the central nervous system and may be related to increased gain in the central auditory pathways and to increased anxiety or emotional response to sound . Hyperacusis has been reported in some systemic conditions and syndromes [6-18], although most cases of hyperacusis have unknown cause [19,20]. Hyperacusis is often associated to hearing loss and tinnitus [21-29]. Peripheral deafferentation following sound deprivation has been indicated as a possible cause, similar to tinnitus [30,31]; according to this hypothesis, sound-deprived brain could amplify incoming sounds, offsetting the reduction in hearing ability on the one hand, and causing discomfort to the person affected on the other . However, not all individuals with clinical hearing loss develop hypersensitivity to sound; recent literature has proposed a role for "hidden hearing loss" in subjects with apparent normal hearing thresholds and a reduced neural output from the cochlea [32-35]. Hyperacusis may involve and be modulated by areas outside the classical auditory pathways following multisensory integration, as also described in tinnitus [36-38]. There is a growing awareness that, although more prevalent during adulthood, children also experience hyperacusis, often in association with audiological and developmental disorders [17,18,39-42]. Data about prevalence and characteristics of this condition during early age are fragmented; estimated prevalence ranges between 3.2% and 17.1% of the general pediatric population [40,41,43-45]. However, comparison studies of hyperacusis prevalence are difficult due to inadequacy and complexity of terminology and definitions. In a retrospective study on 112 children with troublesome tinnitus, Szibor reported hyperacusis in 9% of cases39. A recent study from Coelho et al looked at children aged 5-12 years, reporting that the highest number of hyperacusis children were aged 8 (4 out of 16) . Widen and Erlandsson reported that 19.7% of late teenagers (16-19 years) and 14% of the early teenagers (13-15 years) were oversensitive to noise . A study from Hall and colleagues found a prevalence of 3.7% in a much larger sample of 7097 11- year old children . Some authors reported that females seem to be more affected than males ; while others that hyperacusis is more common in boys . Hypersensitivity to sound may have significant effects on behavior: for some children, it can be extremely distressing and trigger avoidance behaviors that lead to isolation and affect social interactions and daily activities  with potential consequences on education, communication and learning [47-50]. Hyperacusis is also associated to developmental disorders; higher prevalence has been reported in autism [17,51-53] and Williams Syndrome [18,54,55]. The association between behavioral dysfunction, developmental disorders and language impairment has been reported consistently in the literature [55-57]; however, to date, it is not known if hyperacusis alone can have specific effects on speech and language. The aim of this preliminary study is to investigate if and to what extent hyperacusis alone may have an effect on components of speech and language in a sample of children without developmental disorders attending kindergarten or the first year of primary school, with special attention to their behavioral and educational profiles. The study was conducted in 128 consecutive children aged between 4 and 7 years attending kindergarten or the first year of primary school in the State School of Ceccano (Fr), a small town near Rome, Italy, for a period of eleven months between April 2016 and February 2017. The town of Ceccano is in a rural area and is not characterized by specific environmental noise pollution caused by transport, industrial or recreational activities. Exclusion criteria were sensorineural hearing loss, a history of language delay, a diagnosis of language impairment, a diagnosis or a suggestive anamnestic history of developmental disorders, including autism spectrum disorders (ASD), dyslexia and Attention-Deficit Hyperactivity Disorder (ADHD), a recent (< 4 weeks) episode of otitis media. Following these criteria, 109 children (85.15%) were included in the study. Written informed consent was obtained from parents. Hypersensitivity to sound was investigated through the observation of children’s reactions to selected sounds and with the use of a questionnaire administered to parents. The questionnaire was modified and translated into Italian from the one developed by Coelho et al [41,58]. a) Observation: children were observed during their spare time while distracted in playful activities; specific sounds were presented at irregular intervals using a laptop computer connected to two external speakers (Fostex, USA) and children reactions were recorder. A child was considered positive if showed at least one reaction between those listed in Table 1. (1) cover ears with hands; (2) cries; (3) escapes from the sound source; (4) tries to avoid sound; (5) says “hurts ears”; (6) says “I don’t like it”; (7) other negative reaction. Children were observed during their spare time while distracted in playful activities; specific sounds were presented at irregular intervals using a laptop computer when children were nearby, and reactions were recorder. A child was considered positive if showed at least one reaction between the ones listed in this table. Presented sounds were adapted from the ones used in Coelho's interview for children . Table 1: Observation: Children’s reactions to sounds. b) Questionnaire: a questionnaire was administered to parents. The questionnaire included four short and concise multiple-choice questions investigating the relationship that their children have with sounds (RS1-4). Each question had three possible answers: YES (4 points), DON'T KNOW (2 points) and NO (0 points). Compared to the original version of Coelho, our version of the questionnaire also included three questions investigating behavioral and educational profiles of the children (BP1- 3) (Table 2). A child was considered positive if obtained a score equal or superior to 8 points for questions RS1-4. RS1 Do you think that your child is too sensitive to every day’s sounds? RS2 Is there any sound that your child dislikes? RS3 Is there any sound that your child considers painful? RS4 Is there any sound that scares your child? BP1 Do you spend time with your child during the day? BP2 Have you stimulated your child with different sound sources (TV, radio, etc.) from early age? BP3 Does your child look hyperactive in noisy environments? The questionnaire includes four short and concise multiple-choice questions (RS1-4) investigating the relationship that their children have with sounds. Each question has three possible answers: YES (4 points), DON'T KNOW (2 points) and NO (0 points). The questionnaire also includes three questions investigating behavioral and educational profiles of the children (BP1-3). A child was considered positive if obtained a score equal or superior to 8 points for questions RS1-4. Table 2: Questionnaire for parents. • Children with hyperacusis: scored positive in both observation and questionnaire. 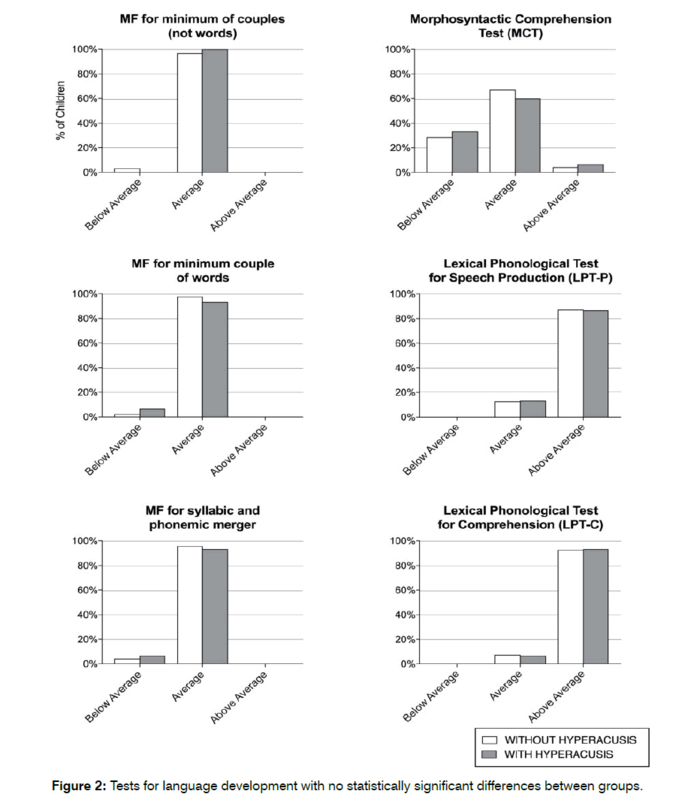 Evaluation of components of speech and language was performed through the administration of the Italian versions of six tests: Mean Length of Utterance (MLU) , Metaphonological Skills (MS) , Phonemic Fluency Test of the Neuropsychological Assessment Battery for Developmental Age (PFT) , Lexical Phonological Test for Comprehension (LPT-C) and Speech Production (LPTSP) , Morphosyntactic Comprehension Test (MCT) . Tests were administered to each child individually by the same speech-language pathologist. A sample of spontaneous speech in a playful and natural situation was initially collected, followed by a structured speech analysis explained by pictures. Spontaneous speech allowed verifying the MLU and assessing altered pronunciation of phonemes. Results of these tests were processed according to percentiles, performance bands and percentages. Each test was analyzed according to its standardization tables; children were defined as below average if they scored below the lowest 5th percentile; average, if between the 5th and 50th percentile; and above average if they exceeded the 50th percentile. Chi-square test with 2 x 3 contingency tables was used to investigate the statistical significance of differences between the two groups of children in the three investigated variables (below average | average | above average). Fisher's exact test was used to compare results obtained in children in kindergarten compared to those in primary school; this test was preferred to standard chi-square because of the small size of the sample (n = 15). A p-value less than 0.05 was considered the cutoff for statistical significance. 109 children were enrolled in the study; 40 attended kindergarten and 69 the first year of primary school. Based on observation and questionnaire, 94 children (86.2%) were included in the group of children without hyperacusis and 15 (13.8%) in the group of children with hyperacusis. Among children without hyperacusis, 38 children were males (40.4%) and 56 were females (59.6%); their mean age was 6.2 years (range: 4-7 years). In the group of children with hyperacusis, 12 were males (80%) and 3 were females (20%); mean age was 5.8 years (range: 4-7 years). Gender difference between groups was statistically significant (p < 0.05). Among children without hyperacusis, 59 (62.8%) were attending primary school and 35 (37.2%) kindergarten. Among children with hyperacusis, 10 (66.7%) were attending primary school and 5 (33.3%) kindergarten. • 93.3% (14/15) of parents of children with hyperacusis reported that their children exhibit episodes of hyperactivity in noisy environments, as opposed to 10.6% (10/94) of parents of children without hyperacusis. The data is summarized in Table 3. Responses given by the parents to questions BP1-3 of the parents’ questionnaire investigating behavioral and educational profiles children with and without hyperacusis. Table 3: Behavioral and educational profiles of children with and without hyperacusis. Components of speech and language were analyzed. A detailed profile was obtained for each child. Detailed results for each test are described below. Results were within average in 92 children without hyperacusis (97.9%) and in nine children with hyperacusis (60%); no child scored above average; two children without hyperacusis (2.1%) and six children with hyperacusis (40%) scored below average. The results were statistically significant (p < 0.0001). When comparing the results of kindergarten children to those of primary school within the hyperacusis group, one kindergarten child (16.7%) and five primary school children (83.3%) obtained scores below average. In contrast, four children from kindergarten (44.4%) and five from primary school (55.6%) scored within average. This finding was not statistically significant (p = 0.58). MS for syllabic and phonemic merger: results were within average in 90 children without hyperacusis (95.7%) and in 14 children in the hyperacusis group (93.3%); four nonhyperacusis children (4.3%) and one hyperacusis child (6.7%) scored below average. The results were not statistically significant (p = 0.32). In primary school, only three children resulted below average (4.3%), all of them were in the nonhyperacusis group; 66 children (95.7%) scored within average, including ten with hyperacusis (15.1%). In kindergarten, two children were below the average, one was in the hyperacusis group (50%); 38 children resulted within average, four with hyperacusis (10.5%) and 34 without (89.5%). The difference in the group of children with hyperacusis between primary school and kindergarten was not statistically significant (p = 0.33). MS for syllabic and phonemic segmentation: 87 children without hyperacusis (92.6%) and 13 children with hyperacusis (86.7%) scored within average; no child resulted above average; seven children without hyperacusis (7.4%) and two children in the hyperacusis group (13.3%) were below average. These results were not statistically significant (p = 0.26). MS for minimum couple of words: 92 children without hyperacusis (97.9%) and 14 children with hyperacusis (93.3%) were within average; no child scored above average; two children without hyperacusis (13.2%) and one with hyperacusis (6.7%), attending kindergarten, had below average results. The results were not statistically significant (p = 0.21). 69 primary school children (100%) were within average, including ten with hyperacusis (14.4%). Three kindergarten children were below average, one with hyperacusis (33.3%) and two without (66.7%); 37 children were within average, including four with hyperacusis (10.8%). The difference among kindergarten and primary school hyperacusis children was not statistically significant (p = 0.33). MS for minimum of couples (not words): The results for this test were within average in 91 children among those without hyperacusis (96.8%) and in 15 children in the hyperacusis group (100%). No child scored above average. Three children without hyperacusis (3.2%) scored below average and all were in primary school. Results were not statistically significant. 69 children in primary school (100%) were within average, 10 of them were in the hyperacusis group (14.5%). 34 children in kindergarten were normal, four were in the hyperacusis group (11.8%); six children were below average, one of them had hyperacusis (16.7%). The difference in the group of children with hyperacusis between primary school and kindergarten was not statistically significant (p = 0.48). The results of this test were within average in 56 children without hyperacusis (59.6%) and five children with hyperacusis (33.3%); 21 children without hyperacusis (22.3%) and one child with hyperacusis (6.7%) scored above average. 17 children without hyperacusis (18.1%) and nine children with hyperacusis (60%) had below average results. The results were statistically significant (p = 0.005). Seven children without hyperacusis (7.4%) and one with hyperacusis (6.7%) were within average; 87 children without hyperacusis (92.5%) and 14 with hyperacusis (93.3%) scored above average; no children scored below average. The results were not statistically significant (p = 0.36). The LPT test for speech production resulted within average in 12 children without hyperacusis (12.8%) and in two with hyperacusis (13.3%); above average in 82 children without hyperacusis (87.2%) and in 13 children with hyperacusis (86.7%); no children scored below average. These results were not statistically significant (p = 0.42). 63 children without hyperacusis (67%) and nine with hyperacusis (60%) scored within average in the MCT test; four children without hyperacusis (4.3%) and one with hyperacusis (6.7%) were above average; 27 children without hyperacusis (28.7%) and five children with hyperacusis (33.3%), four of which attending kindergarten and one primary school, were below average. The results were not statistically significant (p = 0.83). The preliminary results of our study show a statistically significant difference between children with and without hyperacusis for the MLU, a test that evaluates the average number of morphemes (i.e. the smallest units of meaning) in a sentence, and the PFT, part of a comprehensive battery of neuropsychological tests developed for the assessment of cognitive skills and functions in children aged 5-11 years (Figure 1); no significant differences were found in the other tests (Figure 2). Our results suggest that, although it does not appear to be a significant general correlation between language impairment and hypersensitivity to sound, there may be a specific difficulty in lexical access and the use of shorter sentences by children with hyperacusis. Older children had the greatest difficulties, suggesting a possible progressive evolution of the problem with age. Future research studies could evaluate whether children with specific alterations at tests for lexical access and length of sentences, such as the MLU and PFT, have a higher prevalence of hyperacusis compared to the general population of similar age. Figure 1: Tests for language development with statistically significant differences between the two groups. The results of these tests suggest a specific difficulty in lexical access and the use of shorter sentences by children in the hyperacusis group. Figure 2: Tests for language development with no statistically significant differences between groups. Our study identified 15 children with hypersensitiity to sound in a sample of 109 subjects (13.8%). To date, there are only a few studies that focused on the prevalence of hyperacusis in children; a recent systematic review by Rosing et al included three studies and reported a prevalence ranging between 3.2% to 17.1% . All were performed in school settings and limited to small geographical burdens; however, the methodological diversity among them does not allow a direct comparison of their results: one used questionnaires and otoscopy, audiometry and Loudness Discomfort Level (LDL), reporting generic intolerance to sounds in 9% of the sample , the other two used only questionnaires [44,45]. The prevalence of hypersensitivity to sound found in the present study is slightly higher than that previously reported for children attending kindergarten and primary school; this could be attributed to different methodologies for assessing hyperacusis due to considerable fragmentation in its definition, diagnosis and assessment. The criteria used for determining the presence of hyperacusis in the present study require further discussion. Firstly, our questionnaire was adapted from the one proposed by Coelho; however, Coelho also relied on LDL and on a specific questionnaire administered to children to identify hyperacusis. Secondly, in the present study the terms “hyperacusis” and “hypersensitivity to sound” were referred to an adverse reaction and a reduced tolerance to ordinary sounds; a child was included in the hyperacusis group if scored positively to both behavioral observation and questionnaire administration, without differentiating between hyperacusis, hypersensitivity to sound, phonophobia and misophonia. Hall defined children with hyperacusis those that presented an “oversensitivity or distress to particular everyday sounds rather than to loud sounds” . Coehlo defined hyperacusis as “lowered loudness discomfort levels with an abnormal annoyance to sounds” . Such differences in patient selection criteria should be considered when comparing this to other studies. Interesting data emerged from the parents’ answers to our questionnaire and, especially, to the questions about the behavioral and educational profile of their children; their responses showed some differences between the two groups. Parents of children without hyperacusis spent more time with their children during the day and stimulated them with different sound sources (TV, radio, etc.) from early age. When describing the relationship of their children with noise, parents of children without hyperacusis stated that their children were calm even in chaotic and noisy environments, while parents of children in the hyperacusis group reported a hyperactive behavior, a condition that is often associated to attention problems and difficulty in concentration. Concentration difficulties and the lack of attention in noisy environments could negatively affect learning ability of these children and may have an impact on speech and language. These preliminary observations may indicate a specific profile of the hyperacusis child, which has symptoms related to poor behavioral, educational and acoustic stimulation from parents that, in speech therapy, are gaining importance for the understanding of language disorders. These findings could also confirm the role of multi-sensory stimulation of children from birth and highlight the importance of this aspect during the assessment of children with language development disorders. Our study presents several limits. Hyperacusis is an extremely complex and still largely unknown phenomenon that is strictly correlated to behavioral and developmental disorders; although these conditions were anamnestically excluded when enrolling children, subclinical and undiagnosed cases cannot be ruled out and may have biased our results. Similarly, sensory over-responsivity (SOR) has not being investigated in the present study. SOR is a condition characterized by exaggerated behavioral responses towards sensory experiences; children with SOR may be easily irritated and distracted by different sensory stimuli and may present high distress levels . This is the first study to focus on speech and language characteristics in children with hyperacusis in the absence of developmental disorders; the small sample and the lack of other contributions in the literature invite to caution when interpreting and discussing our results that, although may represent an interesting starting point, require further confirmation by studies on larger samples. The questionnaire used in the present study to assess hypersensitivity to sound has been modified and translated into Italian from the one proposed by Coelho in 2007. The questionnaire has not been validated yet as this is the second paper in which it has been used and the first in Italy. Future studies will contribute to validation. Similar to the work of Hall, the methodology used in our study does not allow differentiation between hyperacusis and phonophobia. This may be important for epidemiologic studies but is less relevant for the aim of this study. Last, hearing function and LDL have not been investigated. Although recent otitis media and a positive history for sensorineural hearing loss were exclusion criteria, we could not confirm the absence of these conditions while testing children. LDL is also controversial: Gu and colleagues  evaluated tinnitus and hyperacusis patients and reported a correlation between sound-evoked functional magnetic resonance imaging in the central auditory pathway and LDL scores. On the contrary, Meeus  reported no differences in the LDL scores between patients with and without hyperacusis, and no correlations between the LDL and hyperacusis questionnaire scores, suggesting incongruences between audiometric measurements and hyperacusis complaints as noted by Sammeth in 2000 . These aspects should be taken into consideration in future research. This preliminary study aimed to investigate if hyperacusis alone could have an effect on components of speech and language in children without developmental disorders; our preliminary findings suggest that children with hyperacusis may present specific difficulty in lexical access and often use shorter sentences. Older children appear to have the greatest difficulties; this could suggest a progressive evolution of the problem with age in which prevention could play a role. More studies on larger samples are necessary to further evaluate the role of hypersensitivity to sound on speech and language in children. Aazh H, McFerran D, Salvi R, Prasher D, Jastreboff M, Jastreboff P. Insights from the first international conference on hyperacusis: Causes, evaluation, diagnosis and treatment. Noise Health, 2014;16(69):123-6. Baguley DM. Hyperacusis. J R Soc Med, 2003;96(12):582-5. Chen YC, Li X, Liu L, Wang J, Lu CQ, Yang M, et al. Tinnitus and hyperacusis involve hyperactivity and enhanced connectivity in auditory-limbic-arousal-cerebellar network. Elife. 2015;4:e06576. Middleton JW, Tzounopoulos T. Imaging the neural correlates of tinnitus: A comparison between animal models and human studies. Front Syst Neurosci. 2012;6:35. Salvi RJ, Wang J, Ding D. Auditory plasticity and hyperactivity following cochlear damage. Hear Res, 2000;147(1-2):261-74. Paulin J, Andersson L, Nordin S. Characteristics of hyperacusis in the general population. Noise Health, 2016.18(83):178-84. Morioka WT, Neff PA, Boisseranc TE, Hartman PW, Cantrell RW. Audiotympanometric findings in myasthenia gravis. Arch Otolaryngol. 1976;102(4):211-3. Maciaszczyk K, Durko T, Waszczykowska E, Erkiert-Polguj A, Pajor A. Auditory function in patients with systemic lupus erythematosus. Auris Nasus Larynx, 2011;38(1): 26-32. Di Stadio A, Ralli M. Systemic Lupus Erythematosus and hearing disorders: Literature review and meta-analysis of clinical and temporal bone findings. J Int Med Res. 2017;45(5):1470-80. Ralli M, Di Stadio A, Greco A, Altissimi G, Mazzei F, Turchetta R, et al. Development of progressive hearing loss and tinnitus in a patient with myasthenia gravis: An overlooked comorbidity? Hearing Balance Commun. 2017:1-7. Ralli M, Altissimi G, Di Stadio A, Mazzei F, Turchetta R, Cianfrone G. Relationship between hearing function and myasthenia gravis: A contemporary review. J Int Med Res. 2017;45(5):1459-65. D'Aguanno V, Ralli M, de Vincentiis M, Greco A. Optimal management of Cogan's syndrome: A multidisciplinary approach. J Multidiscip Healthc. 2018;11:1-11. Di Stadio A, Ralli M. Inner ear involvement in multiple sclerosis: An underestimated condition? Mult Scler. 2018:1352458518750010. Ralli M, Greco A, Falasca V, Altissimi G, Tombolini M, Turchetta R, et al. Recovery from repeated sudden hearing loss in a patient with takayasu's arteritis treated with hyperbaric oxygen therapy: The first report in the literature. Case Rep Otolaryngol. 2017:3281984. Villaume K, Hasson D. Health-relevant personality is associated with sensitivity to sound (hyperacusis). Scand J Psychol. 2017;58(2):158-69. Gordon AG. "Hyperacusis" and origins of lowered sound tolerance. J Neuropsychiatry Clin Neurosci. 2000;12(1):117-9. Khalfa S, Bruneau N, Rogé B, Georgieff N, Veuillet E, Adrien JL, et al. Increased perception of loudness in autism. Hear Res. 2004;198(1-2):87-92. Johnson LB, Comeau M, Clarke KD. Hyperacusis in Williams syndrome. J Otolaryngol. 2001;30(2):90-2. Pienkowski M, Tyler RS, Roncancio ER, Jun HJ, Brozoski T, Dauman N, et al. A review of hyperacusis and future directions: Part II. Measurement, mechanisms, and treatment. Am J Audiol, 2014;23(4):420-36. Tyler RS, Pienkowski M, Roncancio ER, Jun HJ, Brozoski T, Dauman N, et al., A review of hyperacusis and future directions: part I. Definitions and manifestations. Am J Audiol, 2014;23(4):402-19. Sheppard A, Hayes SH, Chen GD, Ralli M, Salvi R. Review of salicylate-induced hearing loss, neurotoxicity, tinnitus and neuropathophysiology. Acta Otorhinolaryngol Ital. 2014;34(2):79-93. Moller AR, Salvi R, De Ridder D, Kleinjung T, Vanneste S. Pathology of Tinnitus and Hyperacusis-Clinical Implications. Biomed Res Int. 2015:608437. Ralli M, Troiani D, Podda MV, Paciello F, Eramo SL, de Corso E, et al. The effect of the NMDA channel blocker memantine on salicylate-induced tinnitus in rats. Acta Otorhinolaryngol Ital. 2014;34(3):198-204. Ralli M, Balla MP, Greco A, Altissimi G, Ricci P, Turchetta R, et al. Work-related noise exposure in a cohort of patients with chronic tinnitus: Analysis of demographic and audiological characteristics. Int J Environ Res Public Health. 2017;14(9). Auerbach BD, Rodrigues PV, Salvi RJ. Central gain control in tinnitus and hyperacusis. Front Neurol. 2014;5:206. Katzenell U, Segal S. Hyperacusis: Review and clinical guidelines. Otol Neurotol. 2001;22(3):321-7. Nelson JJ, Chen K. The relationship of tinnitus, hyperacusis, and hearing loss. Ear Nose Throat J. 2004;83(7):472-6. Schmuzigert N, Fostiropoulos K, Probst R. Long-term assessment of auditory changes resulting from a single noise exposure associated with non-occupational activities. Int J Audiol. 2006;45(1):46-54. Fetoni AR, Ralli M, Sergi B, Parrilla C, Troiani D, Paludetti G. Protective properties of antioxidant drugs in noise-induced hearing loss in the guinea pig. Audiological Medicine. 2009;6:271-7. Munro KJ, Blount J. Adaptive plasticity in brainstem of adult listeners following earplug-induced deprivation. J Acoust Soc Am. 2009;126(2):568-71. Knipper M, Van Dijk P, Nunes I, Rüttiger L, Zimmermann U. Advances in the neurobiology of hearing disorders: Recent developments regarding the basis of tinnitus and hyperacusis. Prog Neurobiol. 2013;111:17-33. Schaette R, McAlpine D. Tinnitus with a normal audiogram: Physiological evidence for hidden hearing loss and computational model. J Neurosci. 2011;31(38):13452-7. Weisz N, Hartmann T, Dohrmann K, Schlee W, Norena A. High-frequency tinnitus without hearing loss does not mean absence of deafferentation. Hear Res. 2006;222(1-2):108-14. Fetoni AR, Garzaro M, Ralli M, Landolfo V, Sensini M, Pecorari G, et al., The monitoring role of otoacoustic emissions and oxidative stress markers in the protective effects of antioxidant administration in noise-exposed subjects: A pilot study. Med Sci Monit. 2009;15(11):PR1-8. Salvi R, Ding D, Jiang H, Chen GD, Greco A, Manohar S, et al. Age-Related Hearing Loss and Hearing Disorders: Current Knowledge and Future Directions. Hearing Balance Commun. 2018;16(1):1-9. Ralli M, Salvi RJ, Greco A, Turchetta R, De Virgilio A, Altissimi G, et al. Characteristics of somatic tinnitus patients with and without hyperacusis. PLoS One. 2017;12(11):e0188255. Ralli M, Greco A, Turchetta R, Altissimi G, de Vincentiis M, Cianfrone G. Somatosensory tinnitus: Current evidence and future perspectives. J Int Med Res, 2017;45(3):933-47. Ralli M, Greco A, Cialente F, Di Stadio A, de Virgilio A, Longo L, et al. Somatic Tinnitus. Int Tinnitus J. 2017;21(2):112-21. Szibor A, Jutila T, Mäkitie A, Aarnisalo A. Clinical Characteristics of Troublesome Pediatric Tinnitus. Clin Med Insights Ear Nose Throat. 2017;10:1179550617736521. Hall, A.J., et al., Prevalence and risk factors for reduced sound tolerance (hyperacusis) in children. Int J Audiol. 2016;55(3):135-41. Coelho CB, Sanchez TG, Tyler RS. Hyperacusis, sound annoyance, and loudness hypersensitivity in children. Prog Brain Res. 2007;166:169-78. Ralli M, Rolesi R, Anzivino R, Turchetta R, Fetoni AR. Acquired sensorineural hearing loss in children: Current research and therapeutic perspectives. Acta Otorhinolaryngol Ital. 2017;37(6): 500-8. Nemholt SS, Schmidt JH, Wedderkopp N, Baguley DM. Prevalence of tinnitus and/or hyperacusis in children and adolescents: Study protocol for a systematic review. BMJ Open. 2015;5(1):e006649. Widen SE, Erlandsson SI. Self-reported tinnitus and noise sensitivity among adolescents in Sweden. Noise Health. 2004;7(25):29-40. Landalv D, Malmstrom L, Widen SE. Adolescents' reported hearing symptoms and attitudes toward loud music. Noise Health. 2013;15(66):347-54. Anari M, Axelsson A, Eliasson A, Magnusson L. Hypersensitivity to sound--questionnaire data, audiometry and classification. Scand Audiol. 1999;28(4):219-30. Lucier-Greer M, O'Neal CW, Arnold AL, Mancini JA, Wickrama KK. Adolescent mental health and academic functioning: Empirical support for contrasting models of risk and vulnerability. Mil Med. 2014;179(11):1279-87. Salmeron PA. Childhood and adolescent attention-deficit hyperactivity disorder: Diagnosis, clinical practice guidelines, and social implications. J Am Acad Nurse Pract. 2009;21(9):488-97. Kirk HE, Gray K, Riby DM, Taffe J, Cornish KM. Visual attention and academic performance in children with developmental disabilities and behavioural attention deficits. Dev Sci. 2017;20(6). Hoff AL, Kendall PC, Langley A, Ginsburg G, Keeton C, Compton S, et al. Developmental differences in functioning in youth with social phobia. J Clin Child Adolesc Psychol 2017;46(5):686-94. Thabet EM, Zaghloul HS. Auditory profile and high resolution CT scan in autism spectrum disorders children with auditory hypersensitivity. Eur Arch Otorhinolaryngol. 2013;270(8):2353-8. Ida-Eto M, Hara N, Ohkawara T, Narita M. Mechanism of auditory hypersensitivity in human autism using autism model rats. Pediatr Int. 2017;59(4):404-7. Wilson US, Sadler KM, Hancock KE, Guinan JJ Jr, Lichtenhan JT. Efferent inhibition strength is a physiological correlate of hyperacusis in children with autism spectrum disorder. J Neurophysiol. 2017;118(2):1164-72. Klein AJ, Armstrong BL, Greer MK, Brown FR. Hyperacusis and otitis media in individuals with Williams syndrome. J Speech Hear Disord. 1990;55(2):339-44. Elsabbagh M, Cohen H, Cohen M, Rosen S, Karmiloff-Smith A. Severity of hyperacusis predicts individual differences in speech perception in Williams Syndrome. J Intellect Disabil Res. 2011;55(6):563-71. Carvalho Ade J, Lemos SM, Goulart LM. Language development and its relation to social behavior and family and school environments: A systematic review. Codas. 2016;28(4):470-9. Bevilacqua F, Giannantoni P, Pasqualetti P, di Ciommo VM, Coletti MF, Ravà L, et al. Predictive validity of the Italian parental questionnaire for developmental evaluation at age 4 (QS4-G). J Paediatr Child Health. 2015;51(6):600-7. Bortolini U, Caselli MC, Deevy P, Leonard LB. Specific language impairment in Italian: The first steps in the search for a clinical marker. Int J Lang Commun Disord. 2002;37(2):77-93. Marotta L, Trasciani M, Vicari S. Test CMF. Valutazione delle competenze metafonologiche. Trento, Italy: Erikson, 2008. Bisiacchi PS, Cedron M, Gugliotta M, Tressoldi PE, Vio C. BVN-5 Neuropsychological assessment battery for developmental age. Trento, Italy: Erikson, 2005. Vicari S, Marotta L, Luci A. TFL Test Fono-lessicale. Valutazione delle abilità lessicali in età prescolare. Trento, Italy: Erikson, 2007. Rustioni Metz Lancaster D. Grammar Comprehension Test. Florence, Italy: Giunti Organizzazioni Speciali, 2007. Rosing SN, Schmidt JH, Wedderkopp N, Baguley DM. Prevalence of tinnitus and hyperacusis in children and adolescents: A systematic review. BMJ Open. 2016;6(6):e010596. Carter AS, Ben-Sasson A, Briggs-Gowan MJ. Sensory over-responsivity, psychopathology, and family impairment in school-aged children. J Am Acad Child Adolesc Psychiatry. 2011;50(12):1210-9. Gu JW, Halpin CF, Nam EC, Levine RA, Melcher JR. Tinnitus, diminished sound-level tolerance, and elevated auditory activity in humans with clinically normal hearing sensitivity. J Neurophysiol, 2010;104(6):3361-70. Meeus OM, Spaepen M, Ridder DD, Heyning PH. Correlation between hyperacusis measurements in daily ENT practice. Int J Audiol. 2010;49(1):7-13. Sammeth CA, Preves DA, Brandy WT. Hyperacusis: Case studies and evaluation of electronic loudness suppression devices as a treatment approach. Scand Audiol. 2000;29(1):28-36.